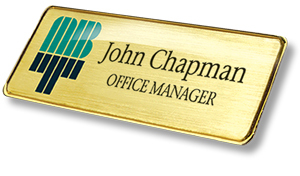 Name Badges International is the Australia leading Designer and manufacturer for High-quality name badges, name tags for corporate, school, professional and personalised. We also offer FREE DESIGN SERVICE that are revised by our professional Graphic Designers after placing the order or even before. Take advantage of this Reusable badge. A simple slide in insert for interchangeable names. This moulded Reusable product is based on the popular Prestige name badge but with the ability to change names. The Reusable name badges concept is designed with crystal clear U.V. coating that preserves the longevity of your resuable badge and maintains the quality.